A member of the Mississippi Band of Choctaw Indians removes the kernels from a corn of cob, one step in the hominy-making process. For special meals like those on birthdays and Christmas, members of the Mississippi Band of Choctaw Indians include hominy on the menu—but hominy, essentially dried corn kernels, is expensive to purchase. That’s why USDA’s Natural Resources Conservation Service is working to help the tribe grow and harvest hickory king corn and other heirloom white varieties and process them to make hominy. Hominy is a traditional food for Native Americans during the winter. 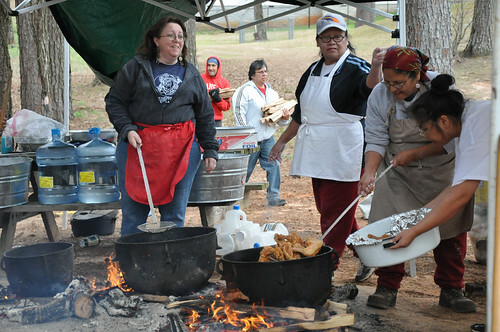 To help restore this tradition, NRCS provided the Mississippi Band of Choctaw Indians, comprised of about 10,000 members across the region, with conservational technical assistance, helping them transform idle land into a hominy-making enterprise. Besides enabling the tribe to provide their own locally grown, fresh produce, growing the corn has trimmed expenses for them. It costs about $25 to purchase the corn used to make one gallon of hominy. If grown and made on site, the hominy costs about $16 per gallon. 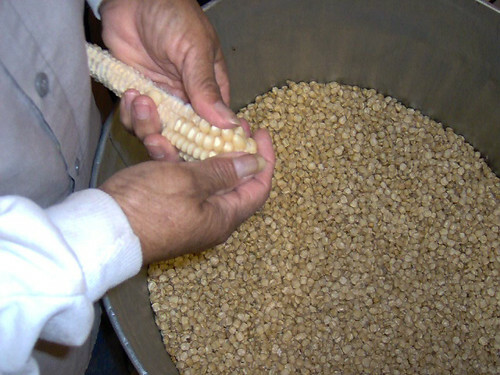 Members of the Mississippi Band of Choctaw Indians are making corn into hominy, a process that allows for better storage of the crucial grain. 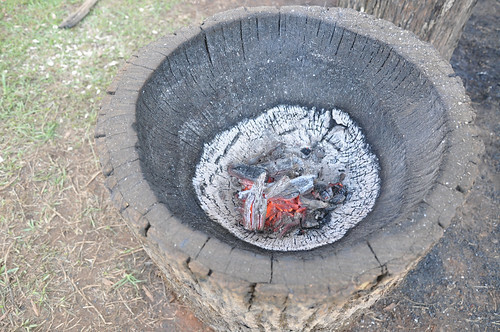 Making hominy starts in the fields, when the corn is left to dry for 120 days. Then, the corn is harvested and kernels are removed from cobs. The kernels are stored in a cool location and left to dry for an additional three months. This step is important because it kills the seed germ inside. The whole hominy experience, from soil to spoon, gives the tribe’s members a chance to rekindle the agricultural traditions of their ancestors. Keeping those traditions alive is a major emphasis of NRCS’ work with Native Americans, says Tim Oakes, the agency’s tribal liaison to the Mississippi Band of Choctaw Indians. The tribe has two acres of corn for hominy, and some of the tribe’s members have planted corn at home. NRCS helped the tribe locate the optimal soil for growing corn as well as other plants, such as giant cane, another significant plant to Native American cultures. A kiti, being made in this picture, is a wooden mortise that Native Americans use to pound corn into hominy. Information on the plants that have played integral roles in the lives of Native Americans can be found on NRCS’s PLANTS Database. NRCS provides conservation programs and technical services to American Indians, Alaska Natives and tribal governments, including the Mississippi Band of Choctaw Indians, through a network of field offices located on and off tribal lands. NRCS has about 75 field offices on tribal lands and employs about 150 tribal liaisons to help put conservation practices on the ground. I think it is very important to keep the culture alive and to pass it on to our next generation. Hope you's have a great success and get much support within your community. I really like the picture of the guy(Rodney Steve) hauling the wood in the back. He is a great friend.